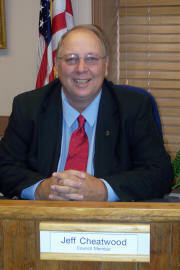 As the City’s Mayor, my responsibilities are supervising city employees along with promoting the City of Hokes Bluff. Among these responsibilities include day to day operations of the city. Also it is my job to present an agenda for council review and preside over the City Council meetings. Allow me to share some of my personal information with you. I am a 1968 graduate of Hokes Bluff High School, married to my high school sweetheart, the former Rita Lynn Norris also of Hokes Bluff. We have 2 daughters, 1 granddaughter, and 1 grandson. Both of our daughters and granddaughter graduated from Hokes Bluff High School. We attend and are members of the First Baptist Church of Hokes Bluff where I am serving as an active deacon. Born in Jefferson County, I attended Birmingham City schools until moving to Hokes Bluff in 1962. I was active in high school sports including football and track for Hokes Bluff High School for 5 years. After graduation, I accepted employment with General Motors Assembly Division in Atlanta, Georgia, where I worked for 2 years. In 1970, Goodyear Tire and Rubber Company hired me as a tire builder. After 3 years, I was promoted to a supervisory position. In 1977, I completed year of management training that prepared young managers for future company positions. It helped prepare me for the many different challenges facing managers running a large industrial plant with a workforce of thousands and an output of thousands of tires daily. I transferred to Goodyear’s Union City, Tennessee plant in 1999 but returned to a position at the Gadsden plant the next year. I was the first Area Manager to return to help restart the Gadsden tire plant. Goodyear allowed and encouraged an on-going leadership journey by providing additional education in professional level management training both on-site through corporate management training and off-site through Gadsden State Community College, Jacksonville State University, and The Bevill Center. Other training was completed at Talmadge Training Center in Akron, Ohio. Their philosophy of on-going training to keep their managers equipped and up-to-date allowed me to continue my education and training throughout my 37 years with the company. I was honored to be inducted into the Goodyear “Top Ten Club,” a club that rewards leadership among the top ten percent of area managers. Our chapter of the “Top Ten Club” was the first one to have the officer’s position of chaplain, a position I was privileged to hold. After a very busy and active 37 years with Goodyear, I retired in order to spend time with my family and become more involved in the community. In addition to my position as Council member and Mayor Pro tem, for 6 years, I now serve as Mayor. I am a member of the Hokes Bluff Lions Club, and served as President of the club during the construction of the new commercial kitchen at the community center. I also served on the MPO Citizens’ Advisory Board, and now as Mayor serve on the Metropolitan Planning Organization. I actively participate in the Alabama League of Municipalities. I attained the designation of Certified Municipal Official in August 2012 and am continuing to attend training toward the designation of Advanced Certified Municipal Official. Currently there are only 1500 officials state wide that hold a CMO designation! The League was formed to train city officials in many areas allowing those that complete the course to stay up to date on new laws, rules and regulations. Mayors and councilmen are held to a more stringent set of rules and laws that dictate to us how we manage our city, than previous administrations. I also serve on the Hokes Bluff Rufus Floyd Library board and Chair the Hokes Bluff Library Foundation. I am also active with East Alabama Regional Planning and Development Commission. It is my desire as Mayor, to keep our city a safe place to live and raise a family. I would like to see our city continue to have that “home town atmosphere” while at the same time move our city forward into the future. It will always be my goal as I work with City Council to look for the greater good for all of our citizens and our city.